Update: During the first ever PC Gaming conference at E3 2015, Hello Games studio revealed that No Man's Sky will officially head to PCs simultaneously with the PS4 instead of launching later like it was originally planned. The studio still says the release date will be announced "soon." 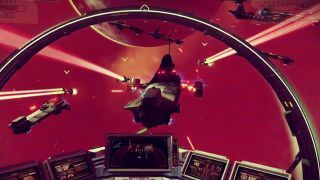 No Man's Sky is a race to the center of the universe, and at Sony's E3 2015 press conference, we're finally seeing gameplay video from the indie title. The scale of the open world game is massive, with the ability to zoom in and out of universes to see what's going on. There's a chance no one has previously ever been to planets you visit. You can certainly leave you mark on places that are inhabited, of course. Every planet in the game is fully destructible, according to the developer. The incredible size of No Man's Sky means that it's not ready to launch just yet. Hello Games simply said "we'll announce a release date soon, I promise." We're holding them to that. It has previously been scheduled for a 2015 release date and a PS4 timed exclusive, but we have to wait for more details following E3 2015. It's one of the more promising titles from the small studio that made the Joe Danger game series. Scanning alien worlds, like the on-the-fly-named Planet E3, will have to wait.